Only showing entries about preparation from Greg Wesson's Esoteric Globe. 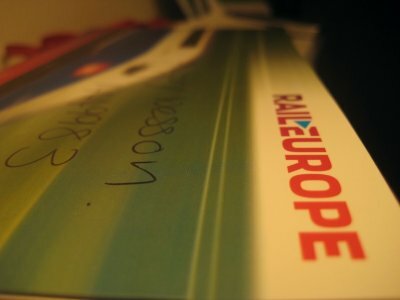 View entries about preparation from all Travellerspoint blogs. I just went out to get my lunch, and it is an absolutely beautiful day today. Sixteen Celsius, very mild and bright despite a layer of clouds in the sky. Gorgeous day. Well, not everyone, obviously, because we would need the train drivers to get us to the picnic grounds, and the tube and bus drivers to get us to the train station. Everyone else, though, should have the day off. Oh, except for the folks who work at Tesco’s, the grocery store, because I don’t have the stuff for a picnic lunch and would have to pick it up. So the train, tube and bus drivers and Tesco’s employees would have to work, but everyone else should have the day off. Wait, I’ll like a cold drink when I get to the park, as I imagine everyone would. So any off license, news agent or convenience store near a park will need to stay open and have someone at the cash register. Train, tube and bus drivers, Tesco’s employees and off license cashiers, all report to work. Everyone else, take the day off! No, just a second. I’ll probably want a pint later in the day from the nearest pub, so the pub landlords will need to be open. Sure, I could get a can of lager from the off license, but I’d prefer my beer in a glass pint. Therefore, the pub will need to be open. Okay, where are we at? Pub landlords, train, tube and bus drivers, off license cashiers and Tesco employees are all at work. Everyone else has a free day. Oh, hang on! 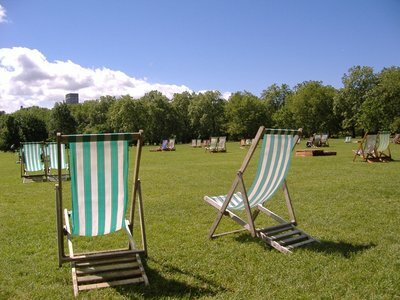 All those people in the park will create a lot of rubbish. We are going to need someone to pick all that rubbish up and clean out the rubbish bins. Park staff will need to be in to do that. Right, train, tube and bus drivers, off license cashiers, Tesco employees, pub landlords and park cleaners - man your posts! The rest of us are going to take a free day. 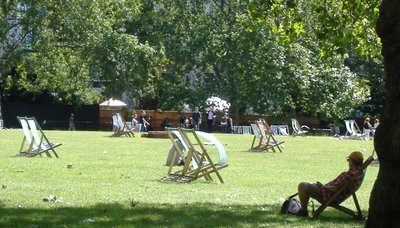 Though, I don’t really like the idea of all those people in the park at the same time I am. I’d prefer a nice quiet patch of grass. Actually, I guess when it comes right down to it, I really only care if I get the day off. The rest of you I don’t care about. So that’s it – everyone report to work but me. Hey, here comes my boss. Wonder what she’s about to say? I need to work overtime tonight? No chance of getting out and enjoying the weather? No picnic for me today. I suppose it is some consolation that I can see the parking lot of my office from outside my window. It sure looks nice out. ...and yet, I still decided to write a blog entry about it. It has been two weeks since I got back from Lille, though thanks to my verbose writing, you've still been reading about it for weeks. In the time since returning, not too much exciting has occurred. Spring has sprung in London. 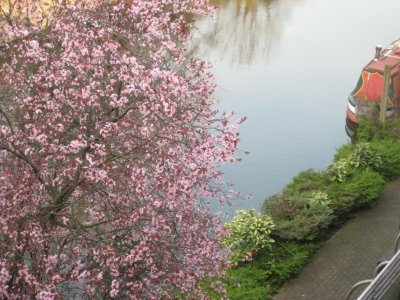 Here's a picture of the cherry tree outside my place. I took the photo a few weeks ago. The bright pink blossoms have now given way to tree of dark red leaves. Even better, my hay fever, which was causing me much aggravation in the middle of March has disappeared. Hopefully it doesn't come back. It's strange to have been suffering the effects of hay fever at a time of year when back in Toronto they snow wouldn't have even been off the ground. Right before I went away to Lille, I had to take my Apple down to the Apple Store. The CD drive had stopped working, which was impairing my ability to play the new U2 CD. To repair the CD drive and also fix the screen (which I had water damaged due to an ill advised attempted cleaning) cost £360. That is in fact more than my other computer, a Packard Bell Windows machine cost in total. Macs are a lot like German cars, I think. They are finely crafted and you pay a premium to own one. They run really well, and rarely have problems, but when they do... look out, because your wallet is going to be a lot lighter. Well waiting for a "genius" from the "genius bar" to help me (god, sometimes you really have to hate the arrogance of the Apple folks, don't you), I went and bought a new phone. That was another £40. The previous day I had spent £180 on a U2 ticket. I don't know what I am thinking. I better hope I don't lose my job, otherwise all this conspicuous consumption is going to catch up with me. Trips to France, computers, phones, fancy soups from Sainsbury's. I tell you, I'm going wild. Anyway, the genius at the genius bar, who looked like Earl Hickey from My Name is Earl, only with less hair, told me that he'd need to replace the drive, and that it would take a while, so I left the computer with them and plodded off to France. When in Lille, I got a call that I could come pick it up. Once back home, I dropped into the Apple Store, and picked up the machine. Nice and clean with a new, non-water damaged screen. Only one last thing to try. "Can I borrow a CD to check out the drive," I asked. "Sure," the genius said, and went to retrieve a disk. Greatest 1950s TV hits, or some such thing. My computer apparently didn't like 1950s TV, because it refused to play the disk. "Hmm, not working," I said. The genius looked confused. "I need to take this in the back and get one of the technicians to look at it," he said. Not so smart, it seems, for a genius. Anyway, turns out they had to replace the connector to the CD drive as well. I asked the obvious question - "Can you be sure that the CD drive needed to be replaced in the first place? I mean, perhaps the CD drive was fine all along, and it was only the connector that was busted." No, I was assured, that both the CD drive and the connector needed to be replaced. *sigh* Just like an auto mechanic. What can you do? Buy a PC that you can work on yourself, I guess... But there not nearly as cool as the Mac, right? I returned to Sheffield, and was in for a treat. I walked into my hotel room for the week to find something I had never seen in a hotel room before. I've stayed in lots of hotels over the years, and seen some pretty decent things. I've stayed in places that had flat-screen TVs that arise from cabinets, sitting rooms with small bars and fridges, places wired for sound with decent hi-fi systems. I even once had a hotel room that had a jacuzzi tub that overlooked the Las Vegas strip. I could have, if I had the time and wasn't working, have spent a lazy evening watching the Bellagio water show from a bubble bath. 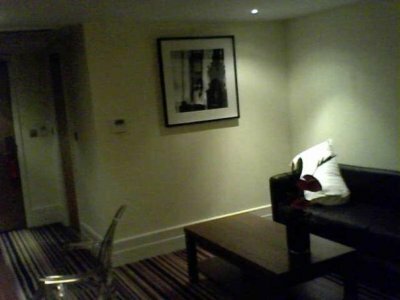 This room in Sheffield had something that none of those rooms had ever had, though. 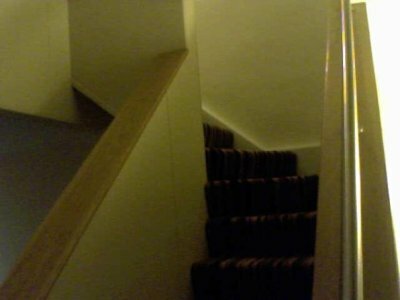 It had stairs. The hotel room was split into two separate floors. One the main floor, where the door was, was the bathroom and a sitting room, with a TV and the internet connection. On the upper floor, the bedroom with another TV. So sweet. Now this is luxury I could get used to. Of course, I didn't get to spend too much time in the room. Mainly just came back at night after dinner and crashed. I had a lot of work to complete that week, so I was in the office late. How come I never get fancy rooms like that when I go away on vacation? April 4th I was back in London. My flatmate said that the Grand National was on that day. The Grand National is an annual horse race that is held in Liverpool at the Aintree race course. It is, according to the pre-race hype on the BBC, the most famous race horse in the world. I'd never heard of it before, but I'm just a sample of one, so perhaps that is not indicative of its true fame. My flatmate and her family has a yearly tradition of picking some horses and putting down a small wager on it. I joined in by picking a couple horses, and we debated about going down to the local Ladbrokes to put a tenner down on the action, but in the end just agreed on a gentlemen's wager. I suppose that the Grand National would be similar to the Kentucky Derby back in North America (though I had previously thought that is what I would say about the Ascot, so who knows). Anyway, it is a big day for betting on the ponies, and folks who normally wouldn't watch horses race do so when the Grand National is running. There is an image of the Brits has been a little prissy and uptight, not like the rough and tumble Americans. But horse racing here the UK certainly shatters that image. The Grand National makes that Kentucky Derby look a little bit like a merry-go-round. The Grand National is a four-mile long steeple chase, with a total of thirty fences to jump. Riders fall off all the time, and the free horses run along with the race, sometimes impeding the progress of those still on their horses. Even the start is maniacal, with the riders all lining up behind a wire strung across the track, which sometimes doesn't get lifted fast enough at the start and you wind up with jockeys getting clothes-lined. We each picked a long-shot and a decent odds horse. I picked Fleet Street at 100-1 for my long shot, simply because I liked the name, it being a street and all here in London. For my decent odds horse, I debated between the cool-named Comply or Die, but ended up going with Hear the Echo, who was listed as 15:1 in the paper, but by the time the race started had dropped to 33:1. The race was exciting to watch. It took 9 and a half minutes to run, and only 17 horses finished. At one point, the leader of the race, a horse named Black Apalachi, was out in front with a comfortable lead, when he fell on the 22nd jump. The jockey curled up into a ball as the rest of the field jumped the fence and tried not to stomp on him. In the end, Mon Mome won the race, a 100:1 shot! Sadly, my pick, Hear the Echo collapsed on the final ran to the wire and later died. Hear the Echo was the 58th horse to die in the 162 runnings of the race. 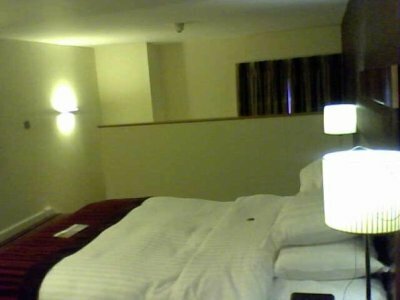 The next week in Sheffield, I had a regular sized European hotel room. It felt small, cluttered and claustrophobic after last weeks two story affair. *sigh* The good ol' days. Prior to the recession, I was quite a little saver. Now, though, I seem to have transformed into a big spender. Oh well, I guess that I am doing my part to try and bring the world back 'round. Mr. Gordon Brown, you can send your thanks later. I did slightly better in my NHL hockey pool, which I wrote about attending back in Toronto in October. 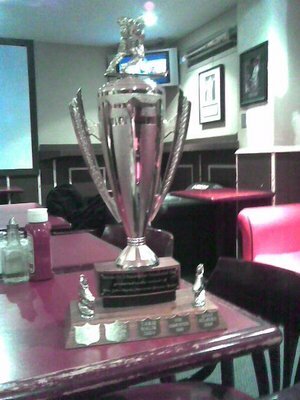 I ended up winning the pool for the second year running. 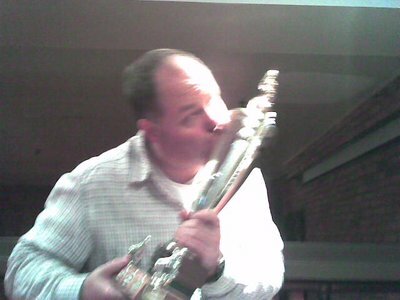 While this shot is from last year, as the trophy is currently safely in Toronto and not here in London with me, this is what I would be doing if I had the trophy here. Get ready for next year. THREEPEAT, BABY!!! "Only a few weeks until you move to London. Are you getting excited yet?" a friend asked me a few days ago. "In all honesty, I don't even really think that it's hit me yet. I know that I am moving, but my emotions haven't had time to catch up. I have way too much stuff left to do," I replied. When I took off the month of May to prep for my move to the UK, I was expecting a little more leisure and a little less of what I have been faced with, which is a lot like work without the paycheque. I look around my apartment that is filled with 10 years accumulation of stuff. Last week I took 5 bags worth of clothes and shoes and 3 huge boxes of books to the Goodwill to donate, but I still have a tonne of stuff left in the apartment. I was going to try and sell it on Craigslist, but I soon discovered that 10 year old Ikea furniture is of little to no value, and the best you can hope for is that someone will cart it away from your place for free. This week I have to start packing up the stuff that I am not taking to London (at least not right away). A subset of my remaining clothes, my CDs, some favourite books, a collection of photo albums and other odds and ends will all need to be boxed up and somehow delivered to a storage unit. Whatever furniture I can't give away for free in the next few weeks will need to go to either one of two places. The first is a charity, which charges $250 to pick up the furniture (it's a donation to cover the expensive of the guys and the truck). Many people (myself among them) were surprised to learn that you can't donate stuff for free, at least not if you want them to come and get it from you. Any furniture that the donation folks won't take (which I assume will be my one crappy couch and my sagging bed) I will need to pay someone a further couple hundred to come and cart away to be recycled or trashed. I knew that collecting all this stuff was pricey, but who knew that getting RID of stuff would be so expensive! I've also tried to get my future life in order. Now that I have my visa, I have been applying for positions. There are a few nibbles so far, but nothing concrete yet. I was hoping to have this all squared away prior to my getting to the United Kingdom, but always, I have underestimated the amount of time it takes to do interviews and get a job. *sigh* Well, at least I'll probably have some time to explore London in a little more detail when I first get there, as I won't have a job to go to during the days. The other thing I wanted to do was get myself set up for banking in the UK. Strangely, it is proving harder to get a bank account open in the United Kingdom than it was to get permission to work there. Her Majesty the Queen and her government decided within 3 days of receiving my application that yes, I would be a welcome addition to the workforce. Banks, on the other hand, seem very suspicious of whole concept of someone coming into the country. Luckily I have a relationship here in Canada with HSBC, but trying to get an account open over in the United Kingdom still required me to fill out 6 pages of application forms that I had to sign in 5 different places. $200 and 2 weeks later, I will find out if they have accepted me into their "club" of customers. Keep your fingers crossed for me! I'd hate to be over in the UK will the ability to receive a paycheque but no way to cash it. HSBC ad from my last trip to London. Who knew it would be so prophetic. 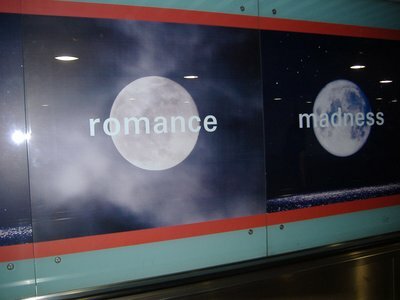 Romance and Madness - it's the only explanation! Not all is gloomy, though. A plan is starting to come together, though. Thanks to the internet, I have both transportation over to London and a place to stay when I get there. I have booked a flight to London, leaving Toronto on June 3rd and arrive in London the next morning. I will collect my bags and take the Heathrow Express to Paddington Station. I wonder if I will run into the eponymous bear there? I will then wander over to the Paddington tube stop, and hop on the Bakerloo line to the Elephant and Castle Station, where I will change for the Jubilee line. I will take the Jubilee line to Willesden Green station, place a call to my new (temporary) landlord, who will take me to my studio apartment, which I have rented for a month until I can find a more permanent place to live. Once I am in that studio apartment, though, I am not sure what happens next. I have stuff I need to do - find a job, find a place to live, get a national insurance number, find a doctor and find the nearest HSBC branch. That first day though, I'm going to take it easy. All I'm planning on doing my first day in town is to find the nearest pub, have a small meal and a beer and let it sink in. On June 4th, 2008, I will be a Londoner. Upon my recent return from Trinidad, I flew on an Air Canada flight that went to Toronto from Port of Spain, Trinidad via Caracas, Venezuela. We spent a total of 45 minutes on the ground in Caracas, and they didn’t even let us off the plane, so unlike Danny Glover, I didn’t get an opportunity to visit with Hugo Chavez. After spending the night flying over the Caribbean Ocean and the United States of America, the plane landed in Toronto at 6 in the morning. I sleepily approached the Canadian customs booth with my completed Canadian Customs Form. “No, they didn’t even let us off the plane"
“Hmm,” she said, looking down again, and circling in red marker the area where I had written that I had $0 worth of good coming back with me. “You didn’t buy anything?” she asked. “Why did you go to Trinidad?” she asked. I said that I had gone down for vacation, and there was a line of questioning regarding why I had chosen Trinidad (because the flights worked out for my week vacation), if I knew anyone there (no), and again if I had bought anything. “Do you have any checked luggage to pick up?” she asked. I replied that all I had was my backpack. “You went away for a week with just that small bag?” she asked. “Hmm,” she said again, and wrote down some cryptic red numbers on the back of my form. They always write down red numbers on the back of the forms when entering Canada. It is, apparently, some sort of code to indicate if a secondary screening was required, and apparently today it was determined that I should be screened. A second customs agent questioned me again before I passed by the baggage claim area, where I was waved into a separate room for a check by a third set of agents. They unpacked my bag and looked at all I had which amounted to a bathing suit, a towel, a couple pairs of t-shirts and shorts, some toiletries, a hat, a flashlight (never actually used) and a camera. They asked more questions about why I travelled to Trinidad, how often I travelled and why I travelled. Eventually I was waved on and got to walk outside into the cold of Canada. I understand completely the suspicion I aroused. A single traveller with no bags and nothing to declare flying through a couple countries where drug and money trafficking is an issue, so I probably would have pulled me aside too. I was treated well, so no hard feelings with the Canadian customs. All three sets of agents asked me, “You didn’t buy anything?” This of course makes sense because that’s their job, however there was something more in the tone of their voice. The tone suggested that more than just ensuring I was following the rules of Canadian custom laws, they seemed surprised that anyone would go away and return with nothing at all. I know it’s strange that I tend to return from most of my trips with nothing to declare. 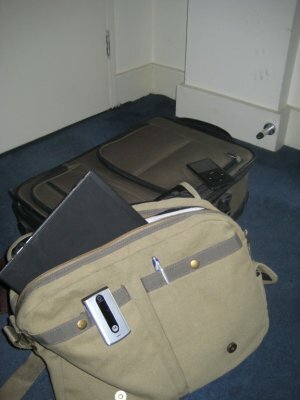 Most people seem to return from travelling with stuff they’ve bought. When I was in France in 2005, a few people asked me what I had bought in the great shopping city of Paris. “Umm, nothing,” I replied. Frankly, I can’t stand crowds in malls and most everything in Paris was pricier than back home, mostly due to the exchange rate between the Euro and the Canadian Dollar. Returning from Beijing, China, I brought back no knock-off bags, pirated DVDs or works of Chinese art. I don’t return empty handed, exactly, though. I do bring back something from every trip, and strangely, it’s something that I left home with. It’s my shoes. More than any product purchased abroad, or even photo of a place, just looking at my shoes reminds me of the great trips I’ve taken. The mud dried on my shoes may be free to pick up, but it feels priceless to me. 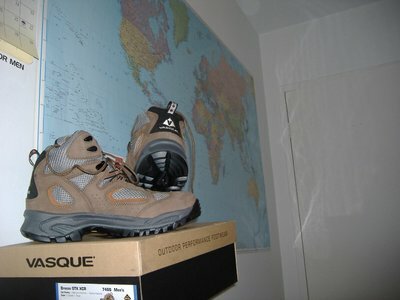 In 2002, in preparation for my trip down to South America, I went out and purchased a pair of waterproof, Gortex covered day hikers made by Solomon. The next day, it rained, and so I went out and splashed around like a 6 year-old, testing the waterproofness of my boots (they were). 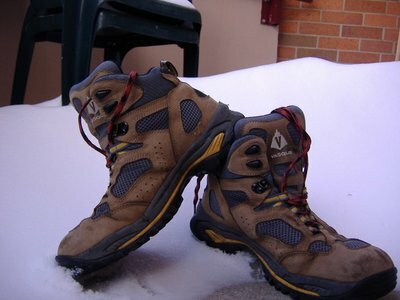 Those boots took me throughout South America, trips to the USA, Dominican Republic, Costa Rica, France, the Netherlands and three-quarters of the way up Mount Kilimanjaro, where my lungs gave out but my shoes were ready to keep going. I loved those Solomon shoes, and was ready to travel the entire world with them. I had hoped that I would be able to stand on all 7 continents with those shoes on my feet, and managed to stand atop 4 continents with them on. I grew very attached to those shoes. They were like a security blanket. Wearing them made me feel outdoorsy and worldly. However, even the sturdiest shoes aren’t built to last forever, and soon I had worn a hole in the sole, which ruined both the waterproof benefit and any support for my foot. In 2005, I replaced my Solomons with a pair of Vasque shoes that had many of the same qualities as the Solomons, like being waterproof, and providing both high ankle support and good arch support. Those shoes saw me from France to Hong Kong, a few stops in Central America, a bunch of trips in Canada and the USA. While wearing the shoes in Trinidad however, I could feel the bottoms getting mushy and I could tell it was only a matter of time until the ball of my foot wore a hole in the sole. With the support fading from the shoe, I started to feel pain in the balls of my feet, which after my previous experience with Metatarsalgia (an inflammation of the balls of the feet that comes from over-use, especially if one is wearing shoes without adequate arch support), I knew it was time for some new shoes. I’m sad to see my old Vasques go. Like the Solomons, I’d grown unusually attached to them. I always felt like a traveller when I put them on. They provided more than just physical comfort. They were emotional comfort as well. I always felt I could face anything that came my way when in a nice comfortable pair of shoes. So today, I went out and bought myself a new pair of shoes. Unlike the experience of replacing my Solomons in 2005, when I was unable to find any Solomon shoes that were like my old ones, I managed to find the exact same “model” of shoe. The only difference is that instead of yellow stripes on the fabric eyelets for the laces, there are orange stripes. So I have a new pair of shoes, and after a short period to break them in, I am sure I will feel ready, both emotionally and physically to take on new adventures in this big world.